THE RISE OF MINIMUM WAGE IN THE STATE OF NEW YORK: HOW ARE SMALL BUSINESSES BEING AFFECTED? The world of small business owners is gradually being shook by the phased increase of the minimum wage signed into law by Governor Andrew Cuomo in 2016. Under the law, small employers, defined as having 10 or less employees, have had to gradually increase their hourly pay each year since 2016 and will continue to do so until 2019, when the minimum wage is scheduled to reach $15 per hour. For small business owners, like Ruben Omar Marchissio, the rising minimum wage is his current biggest challenge. “I ask myself: ‘how will I be able to maintain this business?’,” he said in Spanish. Marchissio immigrated to New York City from Argentina in 1967. 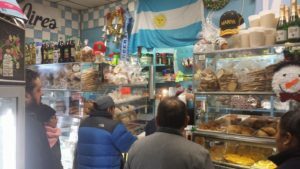 Fourteen years ago, he bought an already established Argentinian bakery in Jackson Heights. This 2016-17 state budget legislation was passed by Governor Cuomo with the goal of restoring economic justice and fairness to working families in the state of New York. The legislation constitutes an increase in minimum wage every year on the same date, December 31st, until it reaches $15 per hour on December 31st, 2019. In New York State big employers (11 or more) and small employers (10 or less) are paying their employees the same amount of $15 an hour of minimum wage, with only one-year difference, big employers will reach the new minimum wage this December 31 with small employers reaching next year. Marchissio sees this as an unfair act against small businesses. “They put us all in the same bag, that’s what Capitalism does. It’s cruel,” Marchissio said. Michael Saltsman, managing director of Employment Polices Institute, recognized the tough situation that small business owners are going through in New York, where labor costs are increasing. “I think [small] business owners are going to have to get more creative in how they adapt to this,” said Saltsman before telling a story about a San Francisco restaurant that adopted the model of making their costumers get their own refills at the bar in order to reduce labor costs. For those who don’t own their space, another challenge faced by small business owners in the era of rising minimum wage, is higher rent. Marchissio doesn’t own the property where his bakery is and he doesn’t have the money to buy it either. “This might have been the cause of my recent heart attack,” he said. Marchissio, who less than a year-and-a-half ago underwent open heart surgery, has considered selling the bakery so he doesn’t have to deal with the stress that this new legislation has caused him. On June 2016, the Black Youth Project along with the Associated Press and the National Opinion Research Center conducted a survey of adults ages 18-30. The survey asked the individual’s views on minimum wage, whether they believed it should be kept at $7.25 an hour, should be eliminated, should be raised to $12, $15 or $20. Out of all the respondents, 43% said it should be raised to $12 and only 19% said it should be raised to $15. Despite the fallout of the rising minimum wage, other small business owners feel differently about the biggest challenge they face. According to the most recent Wells Fargo/Gallup Small Business Index released in July 2018 the number one challenge facing small businesses across the nation is hiring good and qualified staff and retaining them. Maria Florencia Smith is a visual storyteller from Buenos Aires, Argentina. Through her reporting, she strives to create a safe space where marginalized people are being heard and can share their stories. Some of her interests are women's issues, culture and nutrition.